Chill out Allergenistas with these fun smoothies! It’s hot outside and the pool just isn’t doing the trick, so whip up some tasty smoothies for your kids and if you are home alone with your special someone, add your favorite spirit to these great summertime drinks. 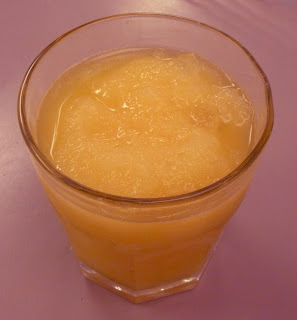 Use these drinks as a starting point, there are so many wonderful fresh fruits available this time of year, or use a fruit nectar, like in our Peach Icy recipe below, if you are tight on time but want to make something a little fun. Enjoy! This sweet treat resembles a strawberry banana shake but without the dairy! Mix in blender until thoroughly blended and ice is crushed. This icy is sweet and peachy, makes me feel like I am in Atlanta! *simple syrup is equal parts sugar and water by weight cooked until sugar dissolves. Videnovich Farms has a great listing of what fruits and vegetables are in season each month in the magazine Edible Chicago. 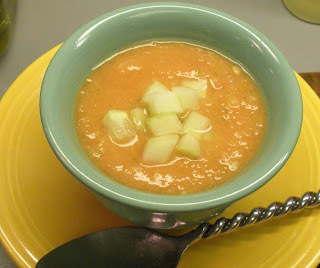 I thought a chilled gazpacho might be in order for the hot days we may or may not see in Chicago (Chicago weather joke)! You can pick up a copy of Edible Chicago at Farmer's Markets and grocery stores. The recipe you see in the picture uses heirloom tomatoes of various colors I picked up at a local farmer’s market, so the color of the soup is orangy-pink, but the taste cannot be beat. This is my favorite time of year, you can get wonderfully fresh and flavorful tomatoes, I could eat a bowl of them for dinner with nothing more than a little salt. Put serving bowls in refrigerator. Take ½ tomato and 1/8 of cucumber, small dice and reserve for garnish. Rub inside of chilled bowls with garlic. Combine garlic and remaining items in a food processor and blend until finely chopped. Place chopped liquid mixture in bowl and top with tomato and cucumber garnish. 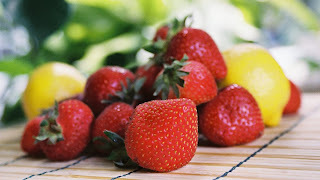 The next post is going to tackle some of the great fruit of the season, can you say SMOOTHIES? Farmer’s Markets in Chicago – Your One Stop Shop for Fresh Vegetables this Summer. One of the reasons I love summer is the Chicagoland Farmer’s Markets - there are over 70 vendors selling natural and locally grown products at over 20 locations around the city of Chicago including right in the middle of the Loop. According to the City of Chicago, the requirements for selling product at farmer’s markets include: Products are locally grown, have seasonal integrity and are of high quality, there is a uniqueness of products offered and each vendor needs to be able to communicate and educate consumers about their products and how and where they were produced (employees must be trained to answer questions, brochures and handouts with more details about the production process). It’s a step in the right direction for consumers as we get to know and decide where our food is made and how. I found some lovely sweet snap peas and sweet baby bell peppers and decided my next recipe must include these crisp treats. Enjoy! Place peas in a pot and add 1” water. Add salt and sugar and bring to a boil. Reduce heat to simmer for 7-8 minutes, until peas are tender. Strain peas and add to a bowl. In a saute pan over medium heat add olive oil. Add shallot and peppers and sweat. 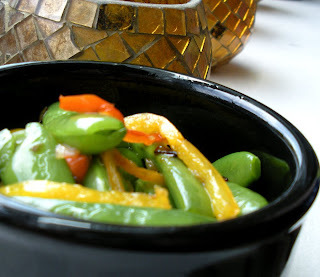 Mix shallots and pepper with peas and plate. Whip up a Summer Salad! 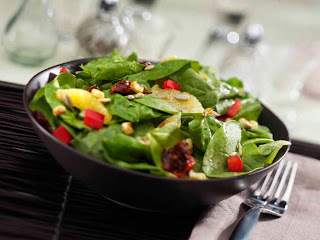 I just love a salad when the weather is hot, and this recipe is quick, easy and a delicious mix of crunch, sweet, tart and juice. The basis of this recipe comes from my good friend Chandrika, she made it for lunch one day, I liked it so much, I asked for the recipe and modified it to be safe for all (Chandrika adds Walnuts and only uses oil and juice for the dressing) Enjoy! On another note allergenistas - I got word from good sources at Ina’s that they now have Fried Chicken that is not only wheat and dairy free, but also is free of egg. I tried it out last Wednesday (they only have Gluten Free Fried Chicken on the second Wednesday of each month, reservations are required) and it delivers great flavor and crunch! Thanks Ina! * Most brands of sun dried tomatoes in oil contained sulphites. You can buy them dry, rehydrate them according to packaging and then let them soak in oil over night. Place pan over medium high heat, add olive oil and let heat. Add corn and cook until browned throughout, remove from heat and cool. You can also buy pre-roasted corn at Trader Joe’s. Mix dressing together and whisk, drizzle lightly over salad. 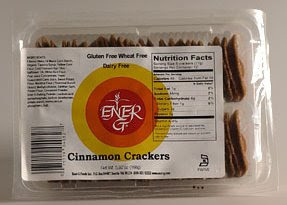 Ener-G sent us this treat for our last Safe and Sound Dinner. Take a few Cinnamon Crackers, spread some Sunbutter, add a handful of raisins or some thinly-sliced apple slices, and voilà, you’ve got the perfect afternoon snack for the kids! I’ve been on a long journey for sugar-free ketchup that doesn’t taste like sugar-free ketchup. Much to my delight, I found Organicville Ketchup. Made with Agave nectar, it’s gluten free and has such a delicious taste, you’d think you were enjoying a summer tomato picked right from your garden. You can find where to buy Organicville products online here. Right now, I’m gearing up to test, adapt, and write more recipes. Let me know what’s on your mind. Do you have a question about food allergies? Or is there a particular recipe you’d like to see? Send your inquiries my way; I’m up for the challenge! 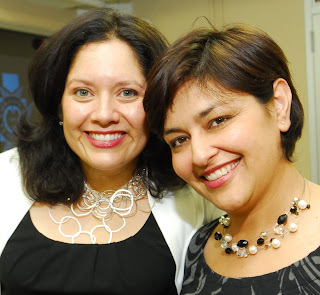 Join me on July 7th at 6p.m. 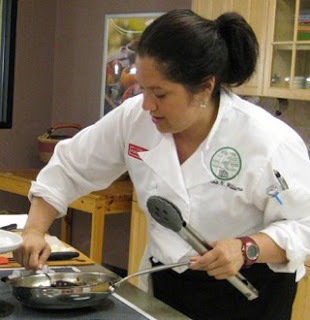 and learn, step-by-step, how to create a sizzling, allergen-free fiesta during an in-depth cooking class at the CHOPPING BLOCK, located in Chicago's landmark Merchandise Mart. During this special 2.5-hour class, you'll learn the intricacies of preparing hand-rolled Pork Tamales, topped with a zesty Tomato Garlic Sauce, along with Mexican rice and authentic salsa...all while remaining free of gluten, as well as free of the other "Big 8" allergens.